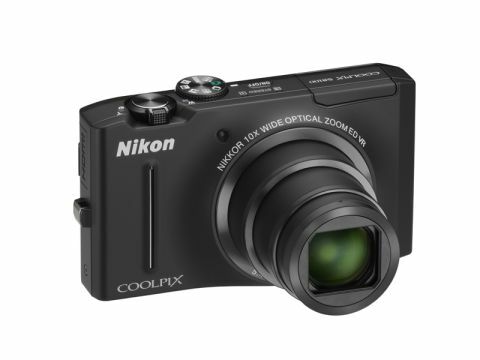 Although it's not stuffed to overflowing with technology, the Nikon Coolpix S8100 has all the essentials, plus a few features that help you get decent shots in tricky situations, notably in low light and fast action situations. It is in many respects very similar to the Coolpix S8000, but the S8100 has a back-lit CMOS sensor with 12.1MP in place of the S8000's 14MP CCD sensor. The benefit of the back-lit sensor (and the drop in pixel count) is that the images should have less noise. Like the S8000, the S8100 has a lens with an equivalent focal length of 30-300mm, not quite as wide as some might like, but a usefully long telephoto optic at the opposite end of the zoom range. Camera shake is an issue with long lenses and low light, but the S8100 has both optical vibration reduction and electronic vibration reduction (VR) to help counter the problem. In addition, the S8100's Motion Detection technology enables the camera to detect camera shake and subject movement, and automatically increase the speed and ISO sensitivity to reduce blurring. As with most modern compact cameras, the Coolpix S8100 doesn't have a viewfinder, but its 3-inch LCD screen has 921,000 dots just like Nikon's DSLRs, plus a wide viewing angle and an anti-glare coating. Automatic shooting modes are the order of the day and the S8100 has a total of 16 scene modes, plus a Scene Auto Selector mode in which the camera is claimed to automatically identify the scene and adjusts the settings accordingly. Exposure control is limited to exposure compensation to ±2EV. In Night Portrait mode, the camera automatically combines a sequence of images, with and without flash, to produce a correctly exposed portrait against a natural looking background. Similarly, in Backlit mode the camera merges a series of consecutively shot images to produce a single high dynamic range (HDR) picture. Meanwhile in Night Landscape mode, the S8100 takes a sequence of 5 shots with a fast shutter speed and combines them into one single, sharp image. Thanks to its CMOS sensor and EXPEED C2 processing engine the S8100 is capable of shooting up to five full resolution images at up to 10fps. And helpfully for those occasions when the decisive moment happens more quickly than expected, up to two images can be recorded before the shutter release is fully depressed. If 10fps isn't fast enough, the S8100 can also record at 120fps at a resolution of 1 million pixels (1280x960) in its Sports Continuous mode. No camera is complete without full HD video capability these days and the S8100 is no exception, it has a dedicated button to activate recording and a built-in stereo mic.